Is Erdogan losing touch with reality? As Turkey teeters on the brink of economic disaster, hot-headed leader Recep Tayyip Erdogan got himself on a crash course with US president Donald Trump. Erdogan reportedly breached a deal about the release of the American pastor Andrew Brunson who was arrested by the regime in Ankara on trumped-up charges about espionage in October 2016. Trump met Erdogan on the sidelines of a NATO summit last June, when relations between his administration and the Turkish regime were still friendly, and closed a deal with the Turkish dictator: Erdogan would release Brunson and Trump would ask Israeli Prime Minister Benyamin Netanyahu to free Turkish citizen Evru Ozkan who was arrested by Israel because his ties with Hamas. After Ozkan was released, Erdogan reneged on his promise and began piling up demands for the release of Brunson. He demanded the extradition of his arch-nemesis Fethullah Gülen who, Erdogan says, organized the botched coup against his regime in July 2016, which some have dubbed a false flag operation. Erdogan’s actions infuriated Trump who slapped sanctions on Turkey in July. Last Friday, the crisis between the two NATO allies exacerbated and the already dire economic and financial situation in Turkey further deteriorated. As the Turkish currency, the lira, lost another 14 percent of its value against the dollar on Friday alone and the inflation rate reached 15 percent, Trump introduced new sanctions against the Erdogan regime. I have just authorized a doubling of Tariffs on Steel and Aluminum with respect to Turkey as their currency, the Turkish Lira, slides rapidly downward against our very strong Dollar! Aluminum will now be 20% and Steel 50%. Our relations with Turkey are not good at this time!,”Trump wrote on his Twitter account. The Tweet followed a statement by a defiant Erdogan who belittled the meaning of the lira fall against the dollar. “If they have their dollars, we have our people and God,” Erdogan said on Thursday evening. On Friday evening Erdogan reacted to Trump’s new punitive measure and delivered a new anti-American rant during a televised speech. "Some countries have engaged in behavior that protects coup plotters and knows no laws or justice. Relations with countries who behave like this have reached a point beyond salvaging," Erdogan charged while threatening "economic war." He then proved he knows nothing about economics and has lost touch with reality. “If there is anyone who has dollars or gold under their pillows, they should go exchange it for liras at our banks. 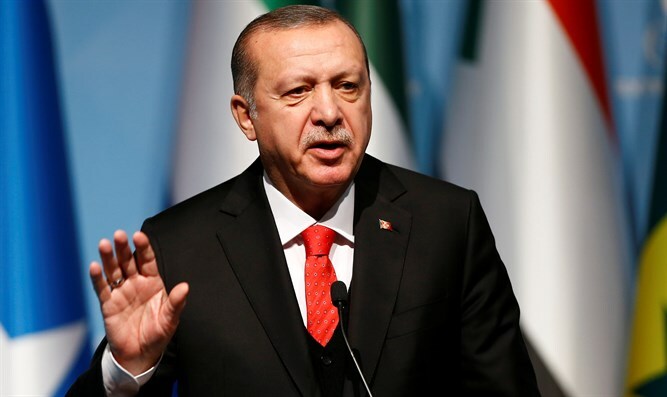 This is a national, domestic battle,” Erdogan demanded from the Turks instead of announcing the conventional remedy for a plunging currency - higher interest rates. After appointing his son-in-law Berat Albayrak director of Turkey’s central bank in June, Erdogan predicted inflation and interest rates would decline soon. We will see inflation and interest rates decline in the coming period,” the Turkish leader said at the time but the opposite predictably occurred and interest rates reached a staggering 17,75 percent. He apparently forgot his image in the United States has been shaped by a series of incidents whereby his massive security detail attacked non-violent protesters on American soil. In an op-ed for the New York Times Erdogan wrote the “partnership with the United States could be in jeopardy” as he accused the world’s only super power of collaboration with the outlawed Kurdish Workers Party (PKK) which Erdogan says is transferring weapons to the Syrian Kurds. Erdogan’s threats to the United States became even more hostile over the weekend when he threatened to leave NATO. “It’s a pity you (the US) choose a pastor over your strategic partner in NATO,” the Turkish leader said during a rally for his supporters. Erdogan also claimed Trump had given him an ultimatum to release Andrew Brunson and said the Americans had told him to release the pastor by “6 p.m. tomorrow”. The Turkish president has now turned to Russian Vladimir Putin to discuss bilateral economic and trade relations as well as an increase in cooperation in the field of energy and defense. "We’ve stood with neighbors before, and will again now,” Zarif told the Turks, claiming “the whole world will unite to force" the United States into rehabilitation of its “addiction."